The rebirth of the original 1967 Camaro Funny Car of Dekker & Mueller. The Logghe Stage 1 chassis has been updated to meet current specs by Ed Quay Race Cars. An alcohol-injected big block Chevy with a vintage Hilborn injectors propels the car down the track close to the et’s of the original blown car. We completed the project and ran events starting in 2007. A new engine was prepared over the off season in 2009 and ready for the 2010 season. We won Editor’s Choice at Super Chevy Show in July ’10 and ran another successful season. 2011 brought another great season of nostalgia events. 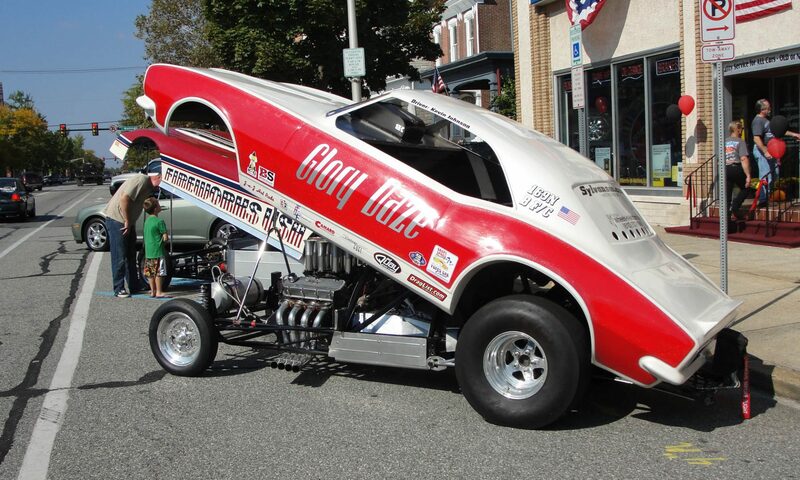 This particular funny car was built by the legend Mark Williams in Colorado in 1967-68. This chassis is a copy of the famous Logghe Stamping Co’s Stage 1 or left-hand steer chromoly funny car chassis with sprung suspension on all four corners. 1967. The first year for the Chevrolet Camaro. 108″ or the stock wheelbase for the production Camaro. Mark Williams copy of a Logghe Stage 1 chassis. Ed Quay Customs updates to bring to current NHRA 8.50 chassis certificate standards. A 454 cuibc inch Big Block Chevrolet with iron heads spitting fire out the period-correct “weedburner” headers. Early Hilborn Fuel Injection with Hilborn pump tuned by Fuel Injection Enterprises (FiE). Chrysler 8 3/4 rear with 4.11 gears spinning Strange axles and stopped by Wilwood brakes. Please check back again. We’re forming the 2018 event schedule! 2018 Puts Glory Daze Back on Track! Stay tuned for more information on the 2018 season and the event dates and appearances for Glory Daze. Thanks to an all-volunteer crew made up of friends and family we’re able to race Glory Daze each season. Thanks to all those who have helped us over the years! An alcohol-injected big block Chevy with a vintage Hilborn injectors propels the car down the track close to the et's of the original blown car.